A superb opportunity for collectors to own two examples of Neil Armstrong's rare and highly coveted autograph presents itself this week. Two Neil Armstrong autographs in a single autograph book are currently auctioning in a single lot at PFC Auctions, which runs until Thursday (September 27). 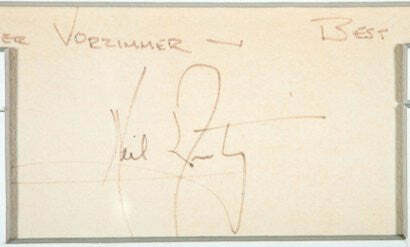 The two autographs were gathered during a March 1972 civic reception for Armstrong in Langholm, a small town in Scotland, the home of the Armstrong clan. The book is accompanied by the consigner's letter of provenance, which reads: "Neil Armstrong and his first wife... came to my home town Langholm… on 11th March 1972. He was made the first Honorary Freeman of the town as it is home to the Armstrong clan. "During this day there were a number of events held in his honour including a civic reception. My father attended this reception and took my autograph book (I was 10 at the time) to be signed." Included in the lot are a scan of a photograph of Armstrong taken by the consigner during the first man on the Moon's visit and a recent local newspaper clipping recalling the events of that day, 22 years before he famously stopped signing autographs. Neil Armstrong was the best performing signature between 2011 and 2012, according to the PFC40 Autograph Index, with his signed photos having risen in value by 26.05%. Paul Fraser, founder of Paul Fraser Collectibles, said recently: "Prior to his death, Neil Armstrong was already one of the most valuable signatures on the market, due to his unsurpassable position as the first man on the Moon, and his reluctance to sign autographs. "With a surge in demand following his death, values have reached a whole new level." This represents a terrific opportunity to invest, with bids currently standing at just £1,758 (approx. $2,850). View the entire space memorabilia section of the auction here.